Just a heads-up: A resident from Sage Mesa asked me to look into natural gas service for that neighborhood. His understanding is that the economics are not quite good enough for Fortis to invest in the infrastructure that is required. 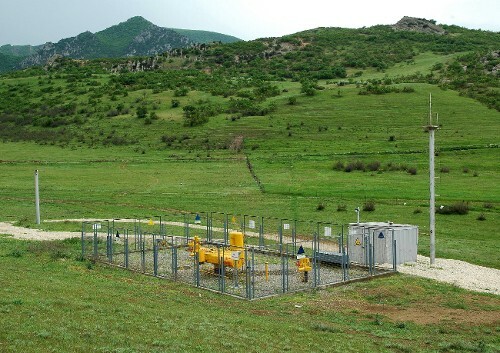 Although a gas pipeline runs through Sage Mesa, a reducing station (the photo is of a Russian reducing station) is apparently required (update: a reducing station is not required). Fortis told him they would run natural gas service to his house if he paid for the reducing station. The West Bench riding ring is a community facility owned by the RDOS, but maintained primarily by those who use it. The following is for the guidance of the latter group in particular to spread the responsibility for keeping the ring in good condition and to avoid irritation and unpleasantness among users. While the ring is a community facility, it was not built for all possible horse activities. The surface is not suitable for activities such as barrel racing or ones involving moves such as sliding stops, and using it in these ways will do serious damage to the surface, especially the quite expensive material along the boards and out for about six feet (see below ** for description of this material). Please do not ride or walk your horse across the park grass. Go up the road at the south end and either enter their or take the path through the trees to the north entrance. I was hoping we could designate the Sage Mesa water system as the RDOS's first priority for this new grant program. However, after scoring the different projects against our criteria, the extension of sewer to properties on Skaha Lake was the clear winner. Having said this, I have already made the case to the province that the Sage Mesa water upgrade could be a quick, high-impact win. My new hope to to eventually attract grant funds from this program to the Sage Mesa project. The motion was to approve a garage without a corresponding house. It passed. The idea here is that the owners have two legal lots. As such, they have every right to construct a house with a garage and a septic field. This proposal is to construct the garage, but not the house and not the septic field. Given its location on silt bluffs, I regard any solution that results in one less septic field to be positive. The following letter was sent to residents of the greater West Bench. Funding for the two firefighter positions cut in the 2014 budget will be restored in the 2015 budget, Penticton city council announced Monday. According to Mayor Garry Litke, the city has been in talks with the Penticton Indian Band since the spring, developing an agreement to provide fire protection, first responder and fire safety inspection services to the band’s new development and residential areas (non-native leasehold improvements) east of the Penticton Channel: Skaha Hills, Riva Ridge, Barefoot Beach Resort, Wright’s Beach Campground and Red Wing. I have received many calls lately about the number of roaming horses on the West Bench. In addition, many people have noticed that some herds have taken up residence on the West Bench full-time. A few years ago it was rare to see a horse on the bench in the summer. Thanks to those of you who could attend the Open House at West Bench School. Thanks as well to RDOS staff who did so much to pull the event together on a warm summer's evening. I have requested an electronic copy of the predesign report for the West Bench supply options. I will post it here as soon as I get it. The report provides much more technical detail about the alternatives (e.g., pump horsepower, waterline routing, and so on). Update 28 July 2011: The focus pre-design report has been posted to the RDOS website. Click here. I have attached the latest version of our internal calculations for three of the West Bench upgrade options (status quo, bulk water, new UV). These are still very rough and pre-design. However, they should give you some sense for the relative costs of the different alternatives. They are also the numbers used in the July 22, 2011, newsletter and FAQ sent to all West Bench residents.